I met up with a friend for a light lunch and catch-up the other week and had a version of this at the pub we visited. It was so good that I wanted to try and recreate - and hopefully improve - it. So, inspiration at the ready, I set about making it as a rather indulgent starter for another friend when she came over for dinner. If you're counting calories, I suggest you look away now. If not? Then get stuck in! The creamy dolcelatte sauce is a delicious accompaniment to the deliciously garlic-y mushrooms and the rocket cuts a little of the richness. Part of this can be prepared in advance, and if you have the time available, I advise that you do as it makes it much less fiddly when it comes to the final assembly. Begin by making the dolcelatte cream: put the cheese and creme fraiche in a mixing bowl and mash with a fork until it is fairly smooth, then stir in the vinegar. Put in the fridge until ready to use. Next, prepare the portobello mushrooms. Trim off any excess stem, then crush a clove of garlic and spread it across the two mushrooms. Season with a little salt and pepper then drizzle with oil. Turn the grill on and bring to temperature. While waiting for the grill, roughly chop the chestnut mushrooms and slice up any larger oyster mushrooms so they are of a similar size to the chestnut mushrooms. Drizzle a little oil into a frying pan and when hot, quickly fry the chestnut and oyster mushrooms to seal in the juices. While the smaller mushrooms are frying, place the portobello mushrooms under the grill and cook for 5-10 minutes, until the mushroom looks cooked (it will shrink a little and some of the juices will show on the bottom skin). Put two slices of sourdough bread in the toaster or under the grill, and when hot rub a scored garlic clove over the surface to give it a garlic flavour. 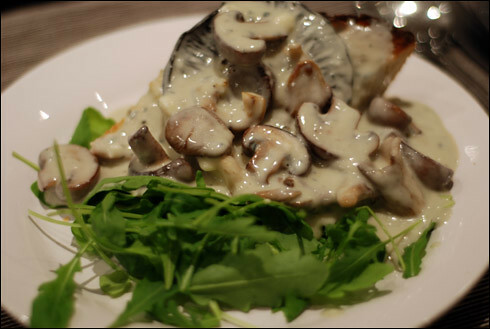 Then finally, spoon the dolcelatte sauce into the frying pan with the smaller mushrooms to melt it, arrange the portobello mushrooms on the toast with a handful of rocket on the side to garnish and spoon the mushroom and dolcelatte sauce over the portobello mushroom. Serve immediately. now that's a compliment if ever i had one!